Taunton takes its name from the River Tone that flows through the centre of town, which is sheltered by the surrounding Blackdown, Quantock and Brendon Hills. Taunton is a pleasant somerset town, with picturesque streets lined with many fine houses and buildings. The impressive 163 ft red sandstone tower of St Mary Magdalene's church (circa 1488) faces the mainly Georgian thoroughfare of Hammet Street, with its long line of white porticoed houses. Georgian architecture also abounds in the High Street. These blend with the 16th-c. Municipal Buildings in nearby Corporation Street, which was originally a grammar school. At the top of the High Street lies Vivary Park, accessed via its original Victorian white ironwork gateway. 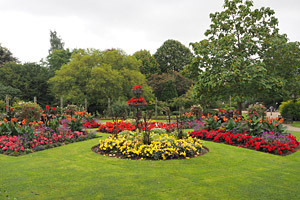 The park, which is the location of the annual Taunton Flower Show, is a splendid example of Victorian urban design. Decorated with ornate fountains, a traditional bandstand and tree lined pathways, leading across wide lawns bordered with brightly coloured flower beds. The rich Vale of Taunton Deane, with its fertile soil and warm climate, is responsible for Taunton's best-known export, cider. The Taunton Cider Company headquarters, just outside the town at Norton Fitzwarren, produce well known brands such as Blackthorn, Diamond White and Red Rock. At Bradford-on-Tone, 3 miles south-west of Taunton, lies Sheppy's Farm, where cider-making by traditional methods can be observed every autumn. The gabled and half-timbered Tudor House in Fore Street, near the Town Hall in the Old Market area, bears the date 1578. It was the home of Sir William Portman, who took the Duke of Monmouth to London for his trial after the rebellion. It is believed that Judge Jeffreys was also entertained there during the "Bloody Assizes". Taunton's Norman castle was the scene of many bitter struggles during the Civil War of 1642, and again in 1685 when Judge Jeffreys held a "Bloody Assize" there. This resulted in 508 supporters of the Duke of Monmouth being condemned to death. The castle retains part of its thick walled keep and the 120 ft long great hall where Judge Jeffreys presided. 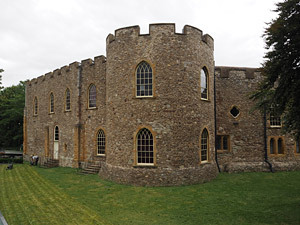 Today the castle is host to the Museum of Somerset. The museum tells the story of Somerset from prehistory to the present day, with information on local geology, archaeology, medieval and ethnography. Exhibits include the Frome Hoard (large collection of Roman coins), the 4th-c. Low Ham Mosaic (detailing the tragic love story of Dido and Aeneas), a Plesiosaur skeleton, a Shrunken Head and Judge Jeffreys' medical bill. The museum also contains the Somerset Military Museum. Alongside its permanent galleries the museum offers a regularly changing series of exhibitions and activities such as family drop-in sessions, plus a programme of special events, including evening talks, music and outdoor theatre. The museum is also open on occasional Sundays for special events. The Somerset Cricket Museum is located in the historic old priory barn, behind the County Cricket Grounds. Exhibits relate to the clubs history, with a collection of cricket memorabilia dating from the foundation of the club, in 1875.